June is National Aphasia Awareness Month! June is National Aphasia Awareness Month. Join us as we raise awareness of this little known condition that affects up to 40% of stroke survivors. 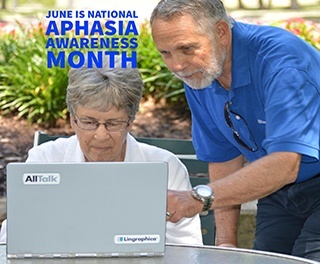 This month, Lingraphica joins our friends at the National Aphasia Association, Aphasia Access, and National Stroke Association, as we seek to raise awareness of aphasia. Aphasia is a communication disorder that affects a person's ability to process and use language. It is a neurological condition caused by damage to the portions of the brain responsible for language, and it does not affect intelligence. Because language plays such a central role in our daily lives, aphasia can be very challenging. Individuals with aphasia may find it difficult to speak, understand speech, and read and write. Approximately 25-40% of stroke survivors develop aphasia. The type and severity of aphasia depends on the precise location and extent of the damaged brain tissue. Aphasia can range from mild—where a task like retrieving the names of objects is difficult—to severe—where any type of communication is almost impossible. While a diagnosis of aphasia can be a tough one, there is hope. Lingraphica has conducted over 30 years of research, which serves as the foundation for the apps, therapy, and devices that we create to help people with aphasia. These tools help people find meaningful and helpful ways to share their wants and needs, personal information, and safety information, which includes information about pain or symptoms of illness. offer free downloads every Friday in June. You can help spread awareness, too! Simply share our posts on your own Facebook page or comment on ours. Creating a dialogue about these important topics is vitally important--especially when it can save someone's life. Whether you are a follower of Lingraphica's Facebook page or have never visited, we encourage you to join the conversation around aphasia awareness. We'll be using the hashtags #aphasia and #AphasiaAwareness in many of our posts...feel free to do the same with your own.